Located in the Deep South region of the United States, Louisiana is the 31st largest size in regard to area and the 25th most populous. Louisiana is the 24th most densely populated state and has borders with Mississippi, Texas, and Arkansas. The Gulf of Mexico is located off the southern coast of Louisiana and the Mississippi River runs along the eastern side of the state. Nicknamed 'Bayou State' and 'Creole State' Louisiana is well-known for its French heritage, with a unique culture based on French roots combined with Spanish, Native American, and African influences. The state doesn't have an official language, with a big focus on freedom and multiculturalism being a big part of the Louisiana lifestyle. This state covers an area of 52,378.13 square miles and has a total estimated population of 4.68 million. The capital city of Louisiana is Baton Rouge, but the biggest and best-known city in the state is New Orleans, with Greater New Orleans being the biggest metropolitan area in the state. Here are some additional details and overviews of the largest cities in Louisiana. 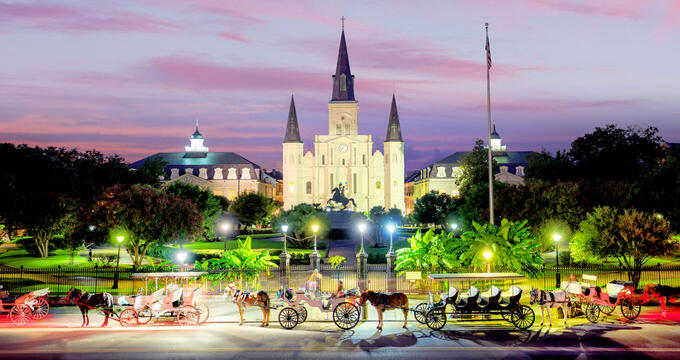 Located on the Mississippi River, New Orleans is a consolidated city-parish in the southeastern part of Louisiana. New Orleans is the largest city in the state, with an estimated population of 393,000, and more than 1.2 million living in the surrounding metropolitan area. New Orleans cover an area of 349.85 square miles. Founded in 1718 and named after Philippe II, Duke of Orléans, New Orleans is one of the most famous cities in America due to its lively, festive culture, Créole cuisine, and special annual festivals. The city is particularly well-known for its annual Mardi Gras festivities, which attract many visitors to New Orleans each year. New Orleans is also unique in that over half of the city's area is made up of water, putting the city at risk of storms and flooding, as witnessed in 2005 when Hurricane Katrina struck the area. Located in the East Baton Rouge Parish, Baton Rouge is the capital city of Louisiana and is also the state's largest city. It is situated in the southeastern part of the state and covers a total area of 88.12 square miles. The estimated population of Baton Rouge is 227,000, with over 830,000 people in the full metropolitan area. Baton Rouge was founded in 1699 and incorporated many years later in 1817. The name of this city translates to 'Red Stick' in English, which is one of the nicknames some people use when referring to Baton Rouge. As the capital city of Louisiana, Baton Rouge is a major industrial, educational, and tech center for the state, home to the Louisiana State University and Southern University. Located mostly in the Caddo Parish, of which it is the parish seat, Shreveport is the second largest city in the state of Louisiana. This city is located in the northwestern part of the state and covers a total area of 122.35 square miles. The total estimated population of Shreveport is 192,000, with over 443,000 in the metropolitan area. Shreveport was founded in 1836 and was named in honor of Captain Henry Miller Shreve, an inventor who helped clear the Red River, as well as the Ohio and Mississippi, for steamboat navigation. The city is the main educational and commercial hub for the northwestern part of Louisiana. Located in Lafayette Parish on the Vermilion River, Lafayette is the fourth largest city in Louisiana. This city is found in the south central part of the state and covers a total area of 53.91 square miles. Lafayette has an estimated population of 129,000, with over 490,000 in the metropolitan area. This city was founded in 1821 and originally called Vermilionville in honor of the river that runs through it, but was renamed Lafayette in 1884 to honor General Gilbert du Motier, Marquis De Lafayette, a French military commander who played a key role in the American Revolutionary War. Located in Calcasieu Parish, Lake Charles is the fifth largest city in the state of Louisiana. It is situated in the southwestern part of the state on the banks of Lake Charles, with Prien Lake and the Calcasieu River also nearby. Lake Charles covers an area of 42.9 square miles, with an estimated population of 76,000. The city was founded in 1861 and originally named Charleston, but renamed to Lake Charles in 1867. The area was named after Charles Sallier, one of the first settlers to arrive in the area. Lake Charles is a popular touristic location and important petrochemical center.